GSC will reach its 11th anniversary on May, so they are going to end their 10th anniversary celebration with a unique project: Re-sale and New Product Request. Yep, GSC is asking your opinion about which product they should put on re-sale and what character you would like them to be made into a product. 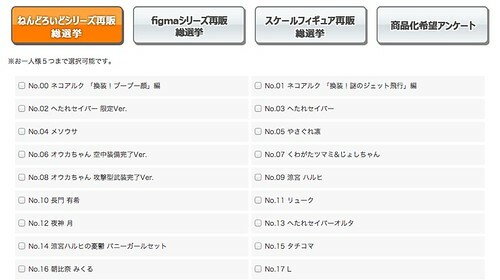 In this page, you may choose up to 5 (five) Nendoroid that you want to be put on re-sale. When you have finished putting the tick marks, scroll down to the bottom of the page and click the right button. FYI, the left button reads “See vote result without voting”. Anyway, there is one other page that you might find interesting: New Product Request. 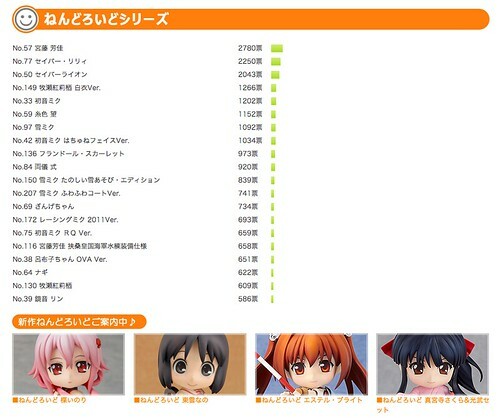 This entry was posted in News and tagged good smile company, gsc, nendoroid. Do you have to enter your request in Japanese, English, or does it matter? I put mine in English though. I’m hoping this works out… would love to see re-release of Saber Lily and Saber Lion XD I’m glad to see Nozomu and Yoshika high up there wouldn’t mind snagging those two. I would sooo love a CCS Nendoroid, she would need kero and such XD I had to vote for Figma Kaito, may be the only shot I have at seeing him. Can’t wait to see how this turns out! But I requested for Sailor Moon and Creamy Mami as Nendoroids. maybe I’ll go back and ask for Magical Emi or Mahou Tsukai Sally. Is the submission period over? I forgot about it and I was going to submit my product requests but it just says some red characters after I type it and press enter now.